When one hears the term “cardio,” the first thought to come to mind is to sit down on a stationary bike, or jog it out on a treadmill for 45 minutes. Not only is this some of the most boring training known to man, but for many of us it is counterintuitive to our training goals and extremely time consuming. In order to burn a significant amount of calories (a necessity, along with a proper nutritional program when trying to achieve health and optimal body composition) you would have to spend a considerable amount of time biking or jogging at light to moderate intensities. These light to moderate intensities I am referring to occur between 60 and 90% of one’s maximum heart rate. In this “zone” your body calls upon muscle fibers that are mainly utilized for short term high intensity tasks (lifting heavy stuff i.e weights, quick and powerul bursts during sport i.e baseball pitch or hard cut) and uses them as endurance fibers. This shift in muscle fiber utilization decreases your strength as well as power (not a good thing even if your primary goal is to simply “stay healthy”). Strength and power are vital to performing activities of daily living (climbing stairs, moving furniture or where I’m from, milking cows) as well as improving athletic performance. But even if your goal is to just lose weight and burn calories, long endurance cardiovascular work is not the most efficient way to go. Whether you are running, biking, or using the elliptical for an extended period of time, you are not working at a high enough intensity to force your body to recover after the session. In other words, once you are done with the training, you are done burning calories (other than what your body would normally burn throughout the day just living). But wouldn’t it be nice if your body were to burn extra calories after your training session? This is achieved when you work at a higher intensity. Training at a higher intensity forces your body to utilize more calories after the training session is completed and also forces you to train for a much shorter duration. 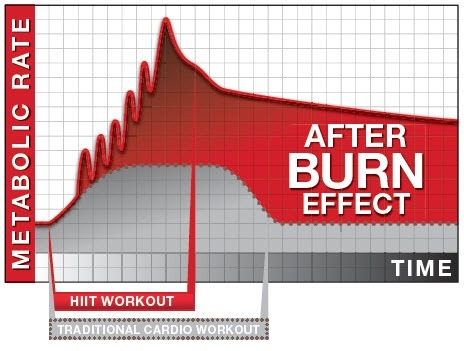 When performing energy work at high intensities, your body must utilize more calorie post training to simply recover. Because these sessions are more intense, you cannot perform them for a lengthy period of time. For most of us, time is limited and this form of training will allow you to achieve a great training effect in less time. 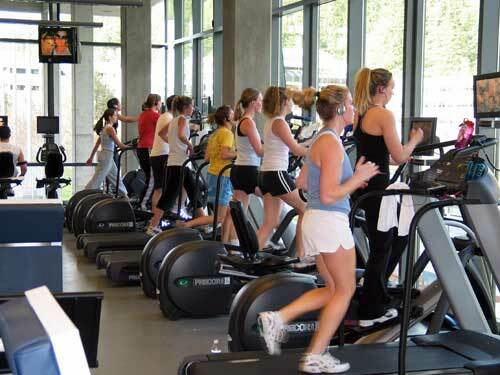 Let’s say you burn 300 calories in a half hour on the treadmill at a low to moderate intensity. Once you step off your body is done burning calories. Now let’s say you perform high intensity energy work (which can still be done on the treadmill or bike but I prefer bodyweight, dumbbell, barbell or medicine ball circuits). You burn only 200 calories. But, these 200 calories were expended in a shorter period of time and instead of your body being through with burning calories, it now has to burn an extra 25 calories for the next 6 hours to recover. According to my math, that would be 350 total calories expended. And best of all, it was done in a much shorter period of time. There are many ways to perform high intensity energy work. These include interval work, circuits, etc. The important thing to remember is that your heart rate should be above 85-90%. You should allow your heart rate to come down a bit between rounds, before again performing some work. Time to get after it…and get off the “Cardio” wagon.